We love receiving your quilts at QFK headquarters in Fairless Hills, PA, near Philadelphia, and we do our best to distribute them nationwide, but if you would like to specifically help your community, you might want to start your own chapter. Until recently we had to limit chapters to the U.S. but now, thanks to Northcott and other Canadian textile manufacturers offering to donate supplies, we are able to extend the invitation to our northern neighbors. 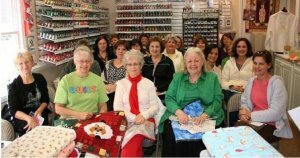 Visit the Canadian Quilting Association blog to learn more. For more information on forming a QFK chapter, email pam.fox@quiltsforkids.org.